This affordable headspace gauge set from Hornady Lock-N-Load Products (formerly Stoney Point) allows the handloader to measure changes to the headspace of cartridges with a dial/digital caliper. 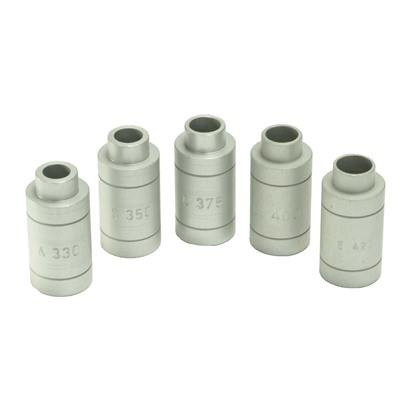 Different bushing sizes (depending on cartridge family) insert into the Hornady Lock-N-Load Comparator Body, which attaches to a caliper. This handloader can then measure the changes between fired and sized brass. this enables the handloader to adjust his sizing dies for a proper fit in his chamber. When a handloader oversizes his cases it can cause excessive headspace problems, one of which is to shorten the life of the brass. The Hornady Lock-N-Load Headspace Gauge Set will allow the user to measure brass from the case head to the datum line on the case shoulder. Five bushing sizes allow you to measure the headspace on most bottleneck cartridges from 17 Remington through the belted magnums. The bushings are sold either with the Comparator Body or without the Comparator Body (for those who already have one). View Hornady Gauge Bushing Chart.